This competitive annual series is planned with a heavy programme of auditions each spring, the prizes being the appearances in the January showcase series; no 1, 2, 3 placement awards. The special opportunity for the musicians (and for some an Achilles heel) is the focus on contemporary music, repertoire by negotiated agreement, some of it by what the Guardian, rather unkindly, characterises as "the same undistinguished home-grown composers who dominate the programmes year after year". Audiences are as ever small, whereas many other competitions tend to attract keen audiences who like to pit their own judgments democratically against those of the juries. Perhaps PLG might consider some such opportunity for their loyalists who attend regularly at Purcell Room? There seems to be building up something of a tradition to field a star violinist on the opening day. This year got off to a magnifcent start, with as fine a solo violin performance as any since January 2000, when I wrote: The very first day produced a charismatic violinist of enormous potential, bidding fair to become a future star and household name. Roman Mints takes his place in my book alongside the talents of two great PLG violin soloists of yesteryear, Stephanie Gonley and Mieko Kanno (less well known only because she has remained loyal to contemporary music as her specialism). Tamsin Waley-Cohen made no compromises in her programme, centring on Ferneyhough's Intermedio alla Ciaconna [c1986] which appeared to make more sense to her than did the composer's inscrutable programme note to most of us. Two tiny Kurtág miniatures didn't assuage our disappointment. Richard Causton's Fantasia and Air won new friends for that composer and the UK premiere of Barry Guy's Lysandra reminded us of its versatile jazz/classical composer's fruitful relationship with his partner, baroque violinist Maya Homburger. There is no doubt that Tamsin Waley-Cohen is supremely talented. Her technical mastery is allied to superb musicianship and a luminous sound. Not an easy programme; all the works were filled with virtuosic pyrotechnics but entirely unlike the light show pieces one often hears. An entire solo violin recital requires formidable concentration and the ability to engage the audience; Tamsin did exactly that. An intense and theatrical performance, the highlights the rhythmic panache of Barry Guy’s Lysandra and the more meditative Homage á Bach by György Kurtág. One criticism; too much tension. Balancing on four inch heels does not provide a stable base from which to perform. Constant shifting from foot to foot and audible heavy breathing appeared to be nervous habits rather than a necessity for great music. Tamsin is obviously a superb violinist and it would only enhance the performance to see her relax, allowing the music to flow organically. Ksenija Sidorova, who studied at RAM in Owen Murray's splendid department, showed some who wouldn't have known, what a wonderful recital instrument is the concert accordion. Takahashi, Berio (his Sequenza XIII) and McGuire (one of 21 expressive showcasing preludes for varous instruments) were followed by Nordheim's Flashing. 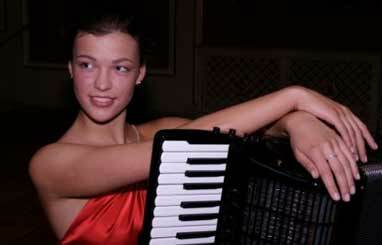 Ksenija "wears" her heavy accordion with an elegance and visible musicality, the fingers dance lightly, she breathes with her bellows, "incarnating every breath of the music in her body" (The Times) and is a delight to watch [see her YouTube video from RAM]. Clare's platform presentation was curious. She came on in a nice short black cocktail dress, with high heels (! ), looking very different from the youthful image in the programme book, that dating, probably, from her time as BBCYM keyboard finalist. Once seated, things got very strange. She rolled around on the piano stool ceaselessly, with disconcertingly jerky head movements whch forced one to look away; high up and right down alternately to no clear pianistic purpose. Definitely a pianist who'd be better on disc or radio, unseen and with the listener in volume control. She would do well to seek a master class with Pierre-Laurent Aimard: q.v. - - with all three pianists Aimard emphasised the importance of 'centred' posture, 'opening' the chest and relaxing to enable production of tone that must not be 'blocked'. Dustin Gledhill was encouraged to sit tall with a straighter back, and to have 'deep structure' in mind to encompass rubato and textures. Natalia Wandoch did exercises alongside Pierre-Laurent to help her with Ligeti's 'crazy games', with noticeable improvement. * q.v. also The Times - - Hammond’s excessively mannered keyboard deportment, and her folly of playing a piano in high heels. Couldn’t a teacher or a close friend whisper something in her ear? Listener friendlier piano playing came later in the evening from Christina Lawrie, who had pleased as a PLGYA in the 2004 & 2005 series. She partnered accomplished RCM tenor John McMunn in song settings by William Bolcom, and produced some of the most memorable (and mostly intimate) pianistic sounds of the evening in Judith Weir's early miniature masterpiece Scotch minstrelsy, settings of Scottish Ballads each with a nasty sting in its tail. Perhaps those involved in negotiating with successful candidates the programmes for the PLGYA weeks should take into account the unsuitability of the Purcell Room for concert grand pianos in full throttle? Note: There will be a second opportunity to hear Clare Hammond in this PLGYA series, with duo partner cellist Richard Birchall; no doubt they are familiar with the "cello joke" which gave rise to the title of Gerald Moore's famous memoirs "Am I too loud?" P.S. 16/1/2010 Clare Hammond was indeed more moderate partnering Birchall, and reviews of that concert and the others on the final day will follow. The problem of piano recitals in the Purcell Room is an ongoing one and lateral thinking suggests an answer. When Sulki Yu performs she owns the stage. She appears completely at ease performing, her whole body honed to expressing the music. The audience was immediately riveted during her performance of Lutoslowski’s Subito; entranced by her signature sound which is both gutsy and sophisticated. Elizabeth Rossiter was equally assured and the two played Bartok’s monumental sonata with character and poise. The pair seemed to have true understanding of the Bartok’s folk idioms. 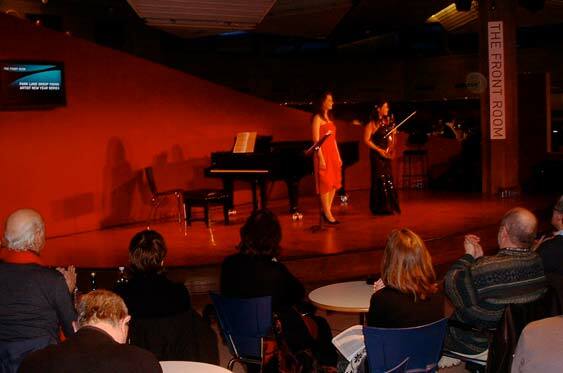 Performing in the Front Room of the Queen Elizabeth Hall cannot be easy as it is only partly screened from the foyer, however this did not seem to disturb the performers’ concentration. It is certainly a pleasant, informal setting; the audience can enjoy a drink whilst listening to great music. Next up was the Piatti String Quartet in the Purcell room. Their regular violist has recently broken his wrist, however playing with his substitute, Hannah Niemela, seemed to pose no problems; the ensemble was excellent. A programme with two London premieres; Anna Meredith’s Songs for the M8 were certainly atmospheric but, on first hearing, Simon Willson's A Slight Angle to the Universe seemed to drift by without direction. Benjamin Britten’s Quartet No.1 with its imaginative textures (for example the stratospherically high opening underlaid by cello pizz.) was inevitably the highlight of the programme. The Piattis played vibrantly, making light of the quartet’s significant technical difficulties. These performances confirmed the musicians involved to be highly professional artists. It is only to be hoped that the nation’s current reluctance to invest in classical music does not hinder their careers and that more opportunities like the Park Lane Group’s Young Artists Series are presented to them. 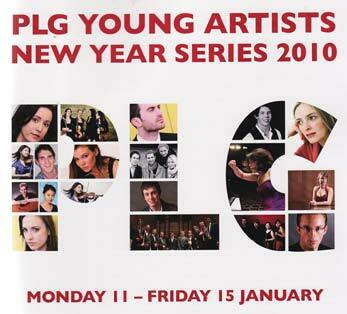 One cannot expect a consistently very high standard in all the new music in the PLG series each year. Thus tonight, Anna Meredith’s Songs for the M8 offered, in the composer’s words, “…a sort [of] homage to journeys bombing up and down the M8 in the middle of the night when I was 17 or 18…”; at last, I thought, a contemporary work with a sense of humour. I was disappointed at what we got; five short pieces, very dour in character, and grey and rather dull in outlook. There was no feeling of “bombing around”, which I would have welcomed. Simon Willson’s A Slight Angle to the Universe too didn’t hold my attention except in its muted coda, well written and genuinely affecting. Its material was underused; there was much movement but no momentum. No idea remained with us long enough to have a real say, and much of the fast music was faceless. Interestingly, everything Willson failed to do Benjamin Britten achieved in in his 1st Quartet; a pleasure to hear such a well written and perfectly conceived work, and the Piatti Quartet seemed more at home here. However, overall I found the show unsatisfying; there was little real get up and go about the performances and I was left wondering how well the Piatti’s would play late Haydn. and cellist Richard Birchall with Clare Hammond (piano). Robert Saxton’s solo Sonata on a Theme of William Walton seemed shapeless and I found it impossible to follow the thread of his argument. Edward Harper’s In memoriam Kenneth Leighton is a long breathed elegy in memory of a friend and colleague, with a disturbed middle section of nightmarish depth. The performance was without peer and Birchall and Hammond made it an intense and deeply moving experience, being in total accord throughout. A slight piece by Sally Beamish, Bridging the Day I found to be made up of material which was over ripe for the small framework within which she was working. Maria Marchant started the show with Kenneth Leighton’s virtuoso Study Variations, op.56, treating each section as a separate entity with breathing space between each. The fact that she played from memory bodes well for the fact that she obviously believes in the piece and will give it again. The whole series ended with Kenneth Hesketh’s Poetic Conceits which Marchant played with consummate mastery but there was too much bluster and complaint, and insufficient tenderness and reflexion, to make a satisfyingly balanced composition. Hesketh is a very thoughtful composerbut this work seemed to have hims not fully engaged with his material - in the same way as I wasn’t involved with it. There’s a good ten minute piece here, somewhere, but at 25 mins it outstays its welcome. * A note by way of epilogue: Hiromi Kikuchi's recording of Kurtág's major work Hipartita [2000-2004, c. 30 mins - BMC CD 129] was engineered by the composer's son, also György, with a different "sound space" contrived for each of the eight movements, all but one of them slow. It is recommended for Kurtág afficionados and collectors of contemporary violin playing. One is left wondering how rare it is for music to be reserved to its dedicatee for so very long, and with the hope that there will soon be allowed a performance in London under the auspices of PLG and given by one of the magnificent violinists featured in their Young Artists series.